We’ve come to another Easter, which in 2019 happens at the same time as Passover. If you haven’t seen our latest Passover post, you have to check it out, too! As always, Join the Pugs is here to bring you the Easter cuteness. And no one brings the cuteness harder than our friends Viking Mops from Zwolle, in the Netherlands. We give them a huge bark out this holiday! 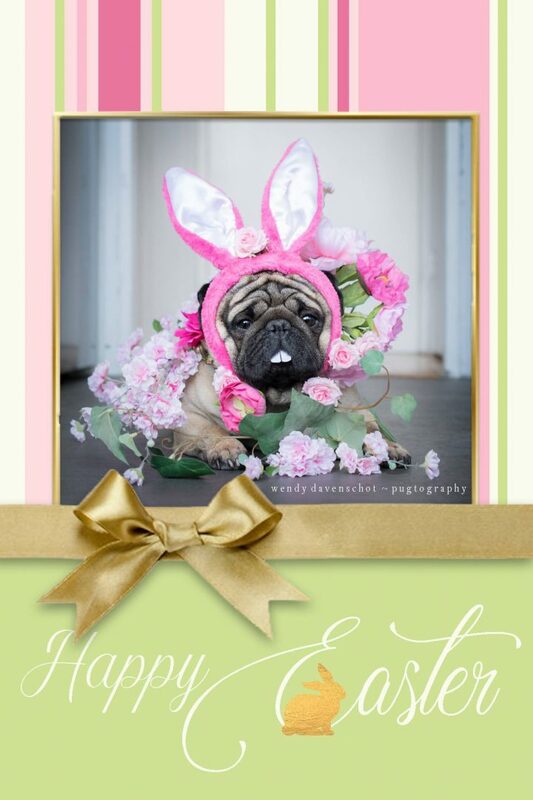 We wish a joyous Easter to you and your family and hope that it is filled with love and pugs to brighten up your life. Don’t forget your four-legged family members this holiday, and shower them with extra hugs. Want to share a story or cute pug photos with us? You can reach us right here. Happy Passover Pug Lover – Learn How Moishe the Pug Found the First Afikoman Ever! 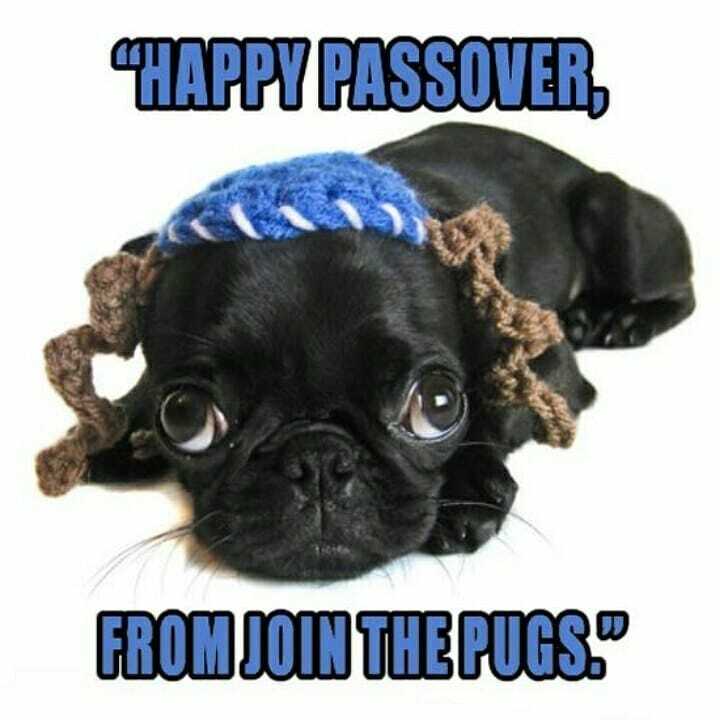 We celebrate the liberation of Jews from slavery this Passover with Moishe the Pug! Our hearts and tails go out to our Jewish friends and family around the world on Passover. Pugs don’t believe in the enslavement of any kind and we are joyous this Passover to celebrate the freedom of Jews everywhere. It’s not a widely known story, but a Pug was the first finder of the afikoman in history! It’s true, at the very first Seder, Moishe the Pug (seen below) not only found the afikoman but set a speed record to find it that is rumored to never be beaten in history! As you may know, the afikoman is intended to be found by a child so that they may demand a treat for their procurement. Legend has it that Moishe was carefully watching his hoomans preparing for the Seder with the concentration of a Buddhist monk. However, during the Yachatz a clever boy attending the Seder cleverly diverted Moishe’s attention. While there is no denying that human children are wonderfully intelligent and resourceful, they lack the food detecting abilities of the noble Pug! How did Moishe find the afikoman? At this point, the child interloper was sure he would find the Matzot dessert. But Moishe was determined! As soon as he realized the ruse, he was back on task! Quick as lightning, the svelte and agile Puglet rushed through the home, discovered the first afikoman and presented it to his hoomans! It’s said that Moishe moved so fast that the hoomans could only see a blur! It’s a record performance never reprised. At first, the hoomans were not amused. Rabbi Rashi scorned Moishe for stealing the thunder from the young and precocious hooman. But when, Rashi looked into the eyes of Moishe, specifically the puppy-eyed look of sadness he presented, the Rabbi succumbed to the adorable Pug! The Rabbi reluctantly granted Moishe the treat he had earnestly found. To this day, Pugs around the world tell the story of how Moishe the Pug obtained the first afikoman during the first Passover! 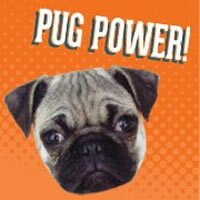 Do you have a pawsome Pug story to tell? We would love to hear it! Drop us a line anytime and spread the cuteness.